I think North Korea might kick off, Kim Jong Un is pretty miffed about losing his Despot with the stupidest hair cuttitle. There was a certificate and everything. Another good candidate. No other countries coming to N. Koreas rescue! Despot with the stupidest hair cuttitle. That really pisses me off, realising I'd not left a space between cut and title. Cutticle sounds like there's something wrong with his nails or his cuttlefish. Although I have heard that Trump's cuttlefish is ailing somewhat. Probably all the attention. Stupidest haircut AND most limited vocabulary! 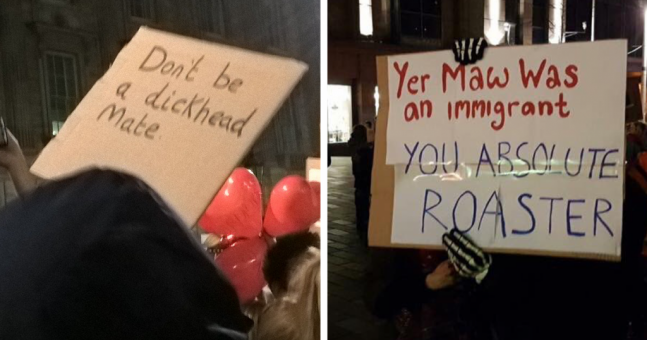 Some anti Trump signs from over here. This song makes me feel proud to be British.